Cody Willoughby | Troy Daily News Second grade boys at Miami East Elementary School engage in grain safety activities on Tuesday during Farm Safety Week, which runs in the district through Friday. 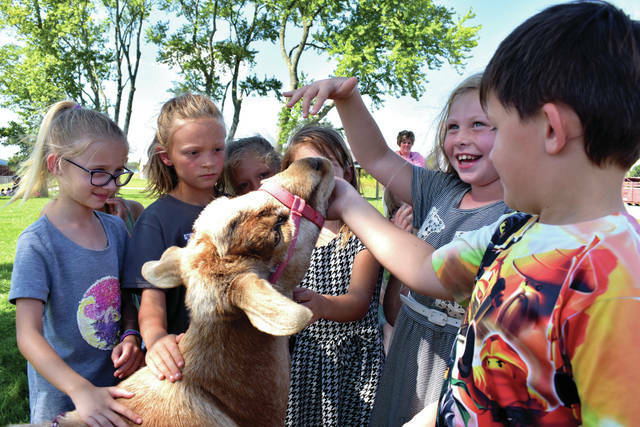 Cody Willoughby | Troy Daily News From left, Miami East second graders Addison Perkins, Lexi Luthman, Amelia Wolfe, Bethany Humphries, and Kael Black interact with a goat during Farm Safety Day on Tuesday. The event was held as part of Farm Safety Week, which runs in the district through Friday. Cody Willoughby | Troy Daily News Miami East second grader Gianna Burgin tries on a hazmat suit during Farm Safety Day, a special event held Tuesday as part of Farm Safety Week in the Miami East School District. CASSTOWN — Second graders at Miami East Elementary learned the importance of caution in agricultural settings during Farm Safety Day on Tuesday. The special event was part of National Farm Safety and Health Week, which runs Sept. 16-22 and is being recognized throughout the Miami East school district through Friday. Approximately 100 second graders were navigated through five activity stations in 15-minute increments, which included lessons on animal safety, equipment station safety, chemical safety, grain safety, and roadway safety. For the animal station, a goat was volunteered by FFA member Maci Krites for children to interact with. “At the animal station, they’re getting to interact with the goat and also do a depth perception activity, where they manipulate their eyeline to show how an animal might see you approaching them,” Carity said. The equipment safety station demonstrated caution on all-terrain vehicles using an orange cone obstacle course, and the grain safety stationed demonstrated the importance of being careful around grain bins and silos. The chemical safety station offered activities on how to proper handling of chemicals and being able to recognize if chemicals are hazardous, while the roadway safety station demonstrated the importance of seat belts using a toy car with dolls on different ramps. 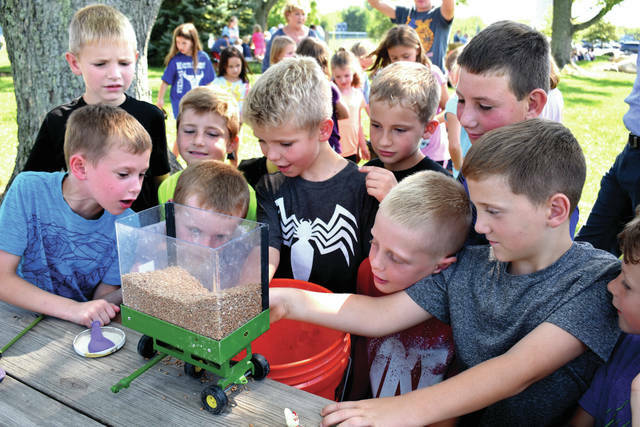 Miami East has now made a long tradition of emphasizing Farm Safety Week every year, having held engaging Farm Day activities for its second graders for at least nine years. The stations were prepared and led by 19 FFA student volunteers, all juniors and seniors at Miami East High School. https://www.dailycall.com/wp-content/uploads/sites/30/2018/09/web1_FarmSafety3.jpgCody Willoughby | Troy Daily News Second grade boys at Miami East Elementary School engage in grain safety activities on Tuesday during Farm Safety Week, which runs in the district through Friday. https://www.dailycall.com/wp-content/uploads/sites/30/2018/09/web1_FarmSafety1.jpgCody Willoughby | Troy Daily News From left, Miami East second graders Addison Perkins, Lexi Luthman, Amelia Wolfe, Bethany Humphries, and Kael Black interact with a goat during Farm Safety Day on Tuesday. The event was held as part of Farm Safety Week, which runs in the district through Friday. 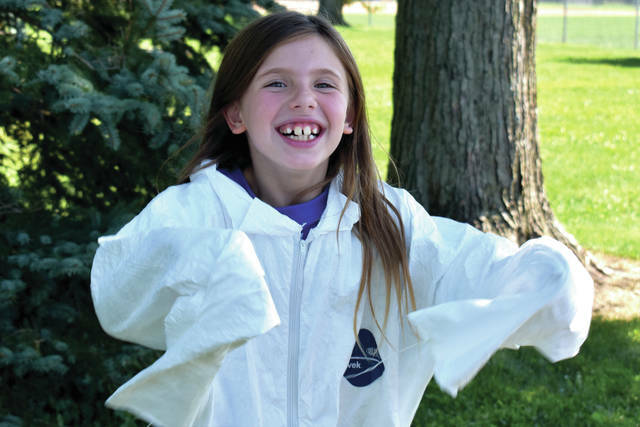 https://www.dailycall.com/wp-content/uploads/sites/30/2018/09/web1_FarmSafety2.jpgCody Willoughby | Troy Daily News Miami East second grader Gianna Burgin tries on a hazmat suit during Farm Safety Day, a special event held Tuesday as part of Farm Safety Week in the Miami East School District.